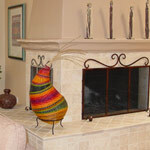 Typically woven in bright colors and whimsical shapes, these Santa Fe Chickens are our most popular pieces. Prices range from $465–2,800, in various sizes. 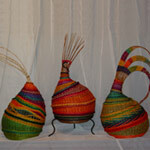 You can also view Sculptural Weavings, Wall Hangings, Installments or all baskets.